In some countries, women who are about to have a baby often hear the sentence “Make sure you get an epidural”. This is standard practice and seen as an easier way to experience a vaginal birth. Along with a variety of other pain relief drugs available, many women think that they can’t survive the pain of labor without at least a little pharmaceutical help. 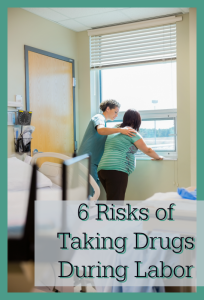 Unfortunately, many women aren’t aware of the rang of risks that come with using drugs during labor for pain relief. There are risks – Having pain medication increases the risk of interventions such as assisted delivery (forceps), bradycardia and tachycardia, perinial tearing and pelvic floor issues. You’ll need more monitoring – Due to the risks of pain medication, you’ll be more likely to have frequent checks and may need to be on continuous monitoring. There are side effects – Some women experience nausea, vomiting, dizziness or extreme itching either during labor or after birth due to some types of pain relief drugs. You may not be able to move – With drugs such as those contained in an epidural, you may be forced to lay on your back which can be restrictive as well as making the birth canal slant uphill which can also increase labor time. It can make baby less alert – Studies indicate that babies born after the use of medical pain relief can be less alert after birth and take longer to feed. Inhibit hormone release – Epidurals can lower the release of hormones such as catecholamine, oxytocin, prostaglandin and endorphins, all of which are important in birth processes such as pushing, contractions and postbirth bonding and emotions. There are times when pain relief medication can be beneficial, such as when the mother is tired or experiencing high blood pressure. However it’s important that women choose their pain relief options based on information about both the risks and benefits. There are at least 45 methods of natural pain relief which have lower risks and side effects which can also be used before making the decision to take drugs. This guest post was written by Susannah Birch from trimestertalk.com. She is a journalist and a birth doula qualified through Childbirth International.